Rema Tip Top Pre Buff Cleaner 32 oz Spout Can BOWES RTC 71. 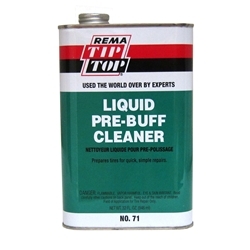 REMA TIP TOP Pre-Buff Cleaners are specially formulated to dissolve mold-release lubricants and other contaminants creating a clean surface prior to innerliner buffing. Available in spout-top liquid or spray-top aerosol dispensers.